I just realized I never checked back in with the rest of our staycation adventures, whoops! We were kind of running around so much that I really didn't want to devote a ton of time to sitting at the laptop. Anyway on Friday we went into Portland and did some frivolous shopping. We went to one of our favorite record stores, and I ended up going a little crazy due to my Beach Boys fandom. Hey, why choose one album when you can get five? We went to Powell's Bookstore and I SWORE I was just going to browse, but naturally came out with two books. One is this highly reviewed book on Charles Manson, the other is Misty Copeland's autobiography, because lord knows one shouldn't read one without reading the other. 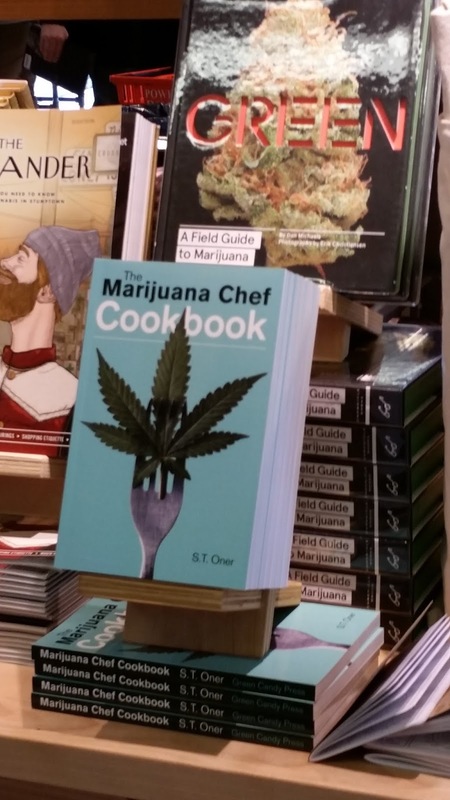 What I did NOT buy was this Marijuana cookbook, I was just mostly amused at how very Portland that display was. A lot of tourists were loitering around it and kind of clutching their pearls over it, I was just sort of bemused by the whole thing. Afterwards we had lunch at this new brewery place and I got a ridiculous burger and a beer sampler. 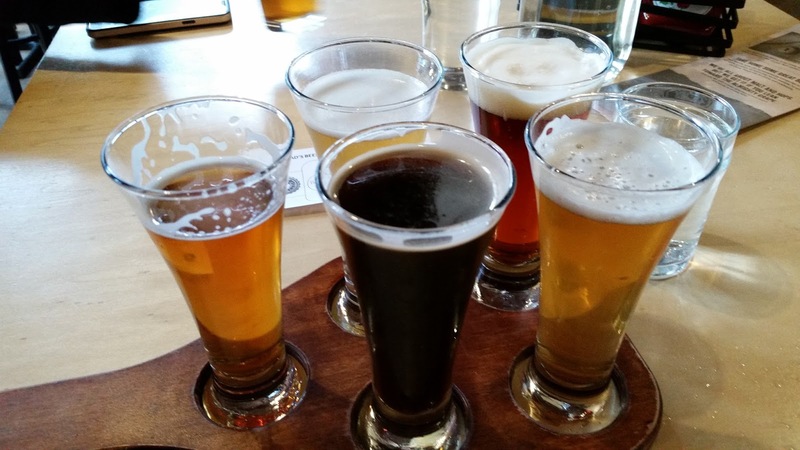 I've really been digging samplers when we go to beer places rather than just getting one beer, it's great for someone like me who has trouble choosing and is worried she might miss out on something good. This way I can try a bunch of beers, and if one is really gross then it's only a couple ounces of grossness. I have to say I was very impressed with all of the beers I picked, they were all very unique and tasty. The best one was that darkest one, it was a chocolate cherry stout aged in whiskey barrels. Delicious! 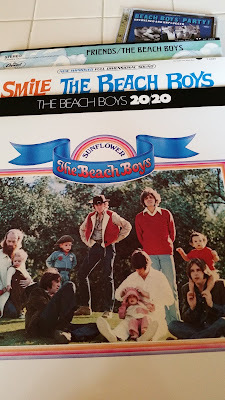 The rest of the weekend was mostly us obsessing about finding an accent chair for Eric's "man cave" and a stereo cabinet for the vinyl player we're getting. We finally found an accent chair he was happy with, but we're having zero luck with the cabinet. We went to 2-3 furniture stores, a couple of box stores and a handful of thrift places and are just not seeing what we're looking for. It's very frustrating! Half of the issue is that everything we're finding is huge and incredibly expensive, and we really just need a very simple setup. At the same time, we don't want some cheap BS thing that we have to spend 5 hours putting together (Eric and I are not handy people, to put it mildly). I'm sure we'll eventually find something, it's just hard when you're looking for something that specific for an audio medium that ain't exactly modern. Our staycation was also riddled with junk food, alcohol and huge portions. As I told my LLL group, it was really fun for like 2 days, but then by last night I just felt gross. I've kept an eye on the scale and I really haven't suffered any weight gain, but I didn't feel good physically by yesterday. I had heartburn, I didn't sleep as well as I have been and I just felt bloated all the time. I was quite happy to get back to my routine today and eat a damn salad frankly. Not much more to write about so I will leave you with the project we finished up yesterday, Eric hung the awesome race medal hanger he got me for Christmas in our guest room/my office. It fits all of my medals perfectly and looks like it was born to be in the room! I think samplers should be offered everywhere. The most difficult part of dining out is trying to decide what to have - especially if is somewhere new and I might not get back to it. 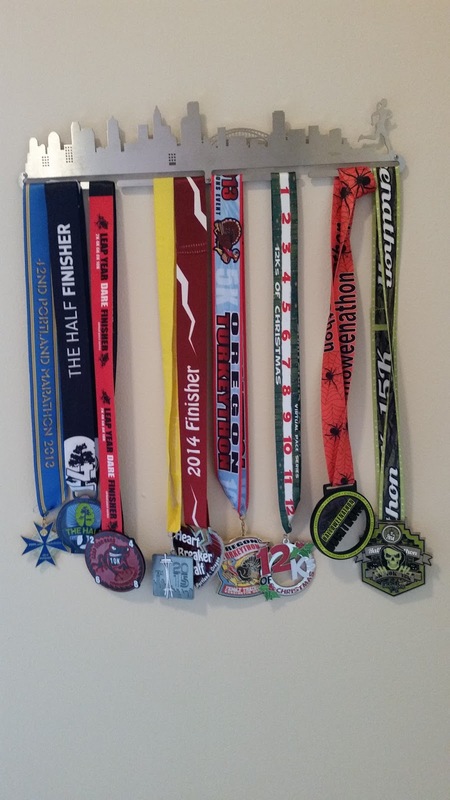 Love your medal rack - I want to get one for my husband. I love beer samplers for the same reasons you noted, especially when they give me a menu card to keep track of what each one was so I can reorder the ones I really liked.